Dubai, UAE, May 01, 2018: Bali is the perfect destination for fans of bohemian art and design, many travel far-and-wide to the popular place in Indonesia to get their hands on the unique and hand-crated pieces. Luckily, Home and Soul have scoured the island’s furniture scene for you, offering you the best sustainable, unique and custom-made pieces here in Dubai making it easier for you to add a touch of ethnic flair to your home. 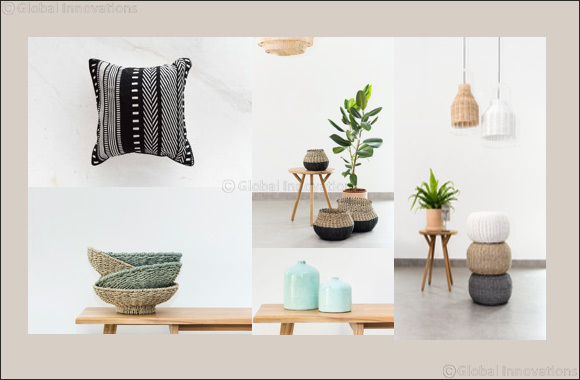 The beautiful hand-made products are made from a combination of natural materials such as rattan, cotton, coconuts, wood and bamboo, that are all sourced from all over the island. Offering an array of beautiful furniture from vintage-looking chandeliers, contemporary dining chairs and gorgeous woven home accessories and textures, all to ensure to update and brighten your home. The products are “made with love by hands” with the highest-quality traditional craftsmanship, ensuring longevity and regular use of the furniture and home accessories. Each item also comes with an affordable price tag to guarantee you aren’t breaking the bank while you are redecorating or simply updating your space with that perfect bohemian feel. Update your tabletops with the ever so practical and stylish Island Bowls, perfect for holding any home accessories and or left to alone for a chic look. The wonderful two-tone baskets add that wonderful ethic touch to your home. Group all together or place individually around the home. The subtle colour palette of the Treviso vase adds a touch of freshness into your home and gives you a lot of opportunities for use: a stand-alone feature or add pretty flowers for a pop of colour. This fabulous pouf has lots of multiple uses and styling options, from dressing up an empty space, a foot rest or a stool for extra seating alternatives. Inject the bohemian trend into your home with the cushion. This beautiful style is the perfect way to update your sofas and seating this season.